Micro Type C, 9.4mm pin spacing. 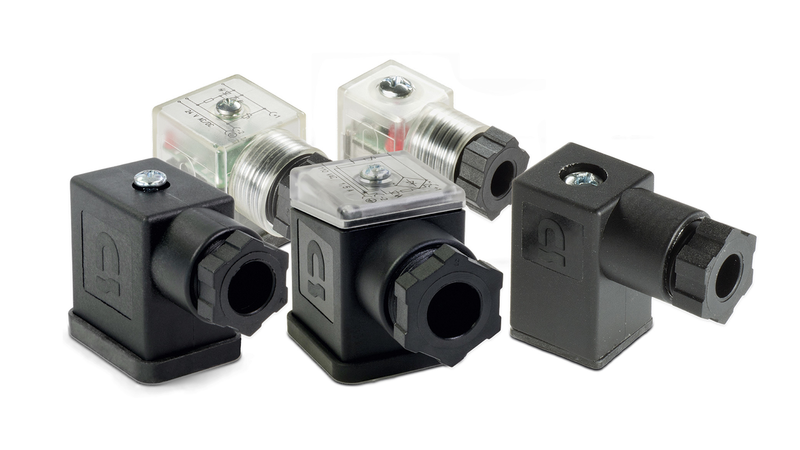 Common applications are hydraulic and pneumatic solenoid valves, sensors, pressure switches and other industrial electronic equipment . These connectors are IP65 rated. The connectors are available without circuit and with LED/surge protection in 24 volt AC/DC, 110V AC/DC, and 230 volt AC/DC circuits. The LED light is perfect indication that power is on at the connector as this assist in trouble shooting. Additional circuits such as LED only, rectified, energy saving (PWM), timer, dual colored LED pressure switch, and others are available on request. The connectors are field attachable allowing the installer to use the specific cable style for the application. The valve plugs, depending on the housing size, can accept cable sizes of 4 to 10mm (0.15 to 0.4 inch). The Form A housing we offer with M20*1,5 and M16*1,5, the Form B and Industrial Type B housings we offer with M16*1,5 and the Form C as well as the Micro Type C we offer with M12*1,5 metrical fine thread at the cable gland. The 1/2-inch NPT conduit threaded housing is available in the Form A, Form B, and Industrial Form Type B sizes. The form gaskets are available in profile or flat version and are made either of NBR or silicone. Choose between 2+ ground and 3+ ground functions.